Lets talk about the 133778 Eclectic Paper-Piercing Pack. Be warned! There is something very therapeutic about pushing a sharp needle though a tiny hole, when you have come to the end of a busy week. I’m not sure if it’s the pop or whoosh noise that does it for me. I know it sounds like I’m a crazy serial killer! But believe me I’m a very easy-going lovable person in real life. You receive 3 templates in the pack. The following item coordinate with this product. If you have been with Stampin’ Up! for a while the following items also coordinate but are now sadly retired. But you may be able to find a follow stamper who would willing share the following. You will also need the following to execute this technique. This is just a little creation that I did today to showcase this product. I paper pierced around the tag and on the little onesise I pierced the little love heart and join the dots to look like stitching. 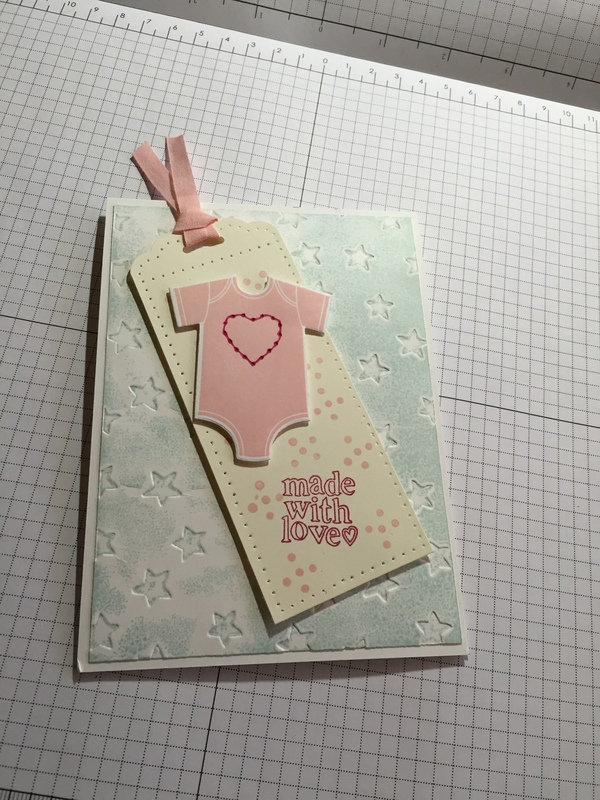 Also another technique I used was achieved by stamping directly onto an embossing folder then passing it though the Big Shot. Other resources used for the card as follows.